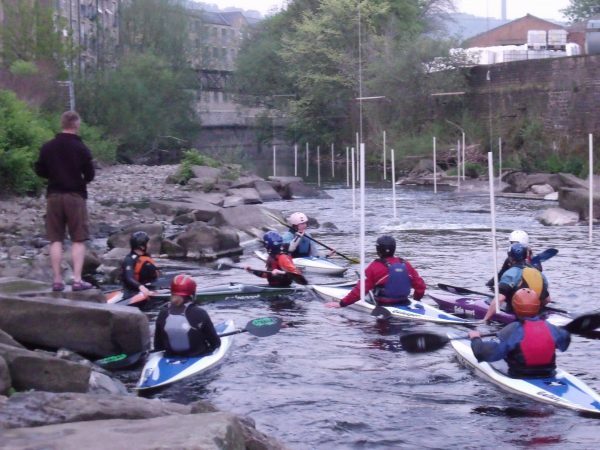 Yorkshire Slalom training at Sowerby Bridge. Aimed at Div 2, 3 and 4 paddlers. If you are unsure whether a training venue is suitable for you, please discuss this with your club coach. Meet at 10:30 for an 11am start. Please note: there is no parking available in the mill complex – it is residents only. All those attending Yorkshire Slalom training days must complete Safety Information Form and complete our Code of Conduct. These need to be updated each year. Boats – As we will have a lot of boats on site, please take your boat straight to the get on area so it is not in the way. Between session please take your boats back up to the get on area. Residents Parking – most people have moved back in after last year’s flooding, so please do not leave boats and kit (or cars) in residents parking spaces – especially not in the space outside the downstairs changing rooms!! See the map for parking, walking route from the car park and location of the river access and exit. Myself and other club members will be there to point people in the right direction, so please follow instructions to get boats etc to where we need them to be.